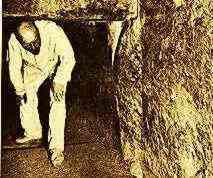 In the early part of the 20th century, there were no facilities in the interior parts to assist the tourist in exploring the steep and dangerous passages of the pyramid. Today there are ramps, lights, handrails, etc. I would like to quote from an account of the explorations of John and Morton Edgar in 1909. Not only is it fascinating reading, but explains the inner passageways in excellent detail. 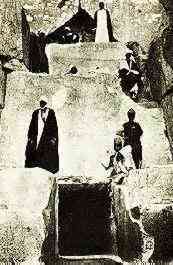 "There is but one original entrance to the interior of the great pyramid. High up the face of the northern flank, and nearly twenty-four feet to the east of the middle line of it, a small doorway leads into the descending passage, which, like all the passages, runs from north to south. So low is the roof of this passage (barely four feet), that we required to stoop considerably, and the difficulty of progression was increased by it slipperiness and step downward inclination. A few feet further down the passage we noticed a depression in the roof, into which a rectangular, dark granite block is fitted. This is the lower end of a series of three large granite stones, named collectively the granite plug, because they completely stop up the lower end of the ascending passage. The lower portion of the descending passage is in direct continuation of the part above, but instead of being built with masonry, it bores through the solid rock on which the pyramid is erected. It ends in a small horizontal passage which, in its turn, leads past a small ante-chamber or recess on its west side, to a large subterranean chamber. Hewn in the solid rock a hundred feet vertically below the base-line of the pyramid. In the unfinished floor of the subterranean chamber appears the large, squarish mouth of a deep vertical shaft. We had always to avoid walking to near its edge, for the rough uneven floor of the chamber is covered with loose crumbling debris. Directly opposite the doorway of the passage through which we had gained access to the chamber, we perceived by the light of our candles another low doorway. On investigating this we found it to be the beginning of a small-bore passage, running horizontal southward for fully 50 feet to a blind end. To proceed up the ascending passage, we required to stoop uncomfortably low, for like the descending passage, its roof is scarcely four feet above its floor. When, however, we reached the southern upper extremity of the passage, we emerged into a large place, where to our joy we found a level floor and abundance of room to stand erect and so relieve our aching backs. We were now at the lower end of the noblest passage in the great pyramid, which has been named the grand gallery. The grand gallery is narrow, being only seven feet in width, but with the aid of a good light its lofty vaulted roof, twenty-eight feet in vertical height, is seen sloping upward into deep obscurity, a most impressive sight. About 160 feet away from us at a level of 70 feet above us, there was the dark square opening of still another low passage. This low passage, which is only three and a half feet square, leads horizontally southwards to a small peculiarly marked apartment called the ante-chamber. From its south wall, a similar low passage leads to a large rectangular hall known as the King's chamber. The King's chamber, constructed entirely of immense beautifully squared and leveled blocks of dark polished granite, is the chief apartment in the great pyramid. The granite coffer is near the west wall of the chamber, and is the only movable article of furniture in the building. Above the King's chamber there are five shallow spaces called "chambers of construction", the lowest is known as "Davidson's chamber" after its discoverer. Access is gained to these chambers by a small passage entering from the top south-east corner of the grand gallery. (these relieving chambers were built to give stability and protection to the King's chamber in the event of an earthquake). We did not get an opportunity to explore these upper chambers; and a visit to them is attended with danger.
" The Edgar brothers made measurements, observations, and recorded many details of the great pyramid. Their photo's are one of the earliest ever taken of the interior of the Great Pyramid of Giza.